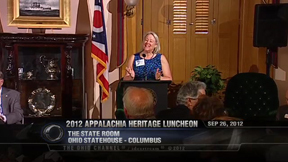 Heritage Ohio, Ohio's Hill Country Heritage Area, and Senator Tim Schaffer present the 2012 Appalachian Heritage Preservation Luncheon: Success in Appalachia. Several community leaders share Appalachian Heritage success stories. As Ohio's official historic preservation and Main Street Ogranization, Heritage Ohio fosters economic development through preservation of Ohio's historic buildings, neighborhoods commercial districts and promotion of Ohio's heritage tourism industry. Ohio's Appalachian hill country is an area rich in history, art, culture and tradition. Ohio's Hill Country Heritage Area encourages residents of the region to work together to improve the quality of life in their communities and to foster sustainable economic development and opportunities and prosperity for future generations.